With all due respect to Daniel Shapiro, former U.S. Ambassador to Israel, the notion that Hamas “prefers to avoid an escalation with Israel” is demonstrably false. 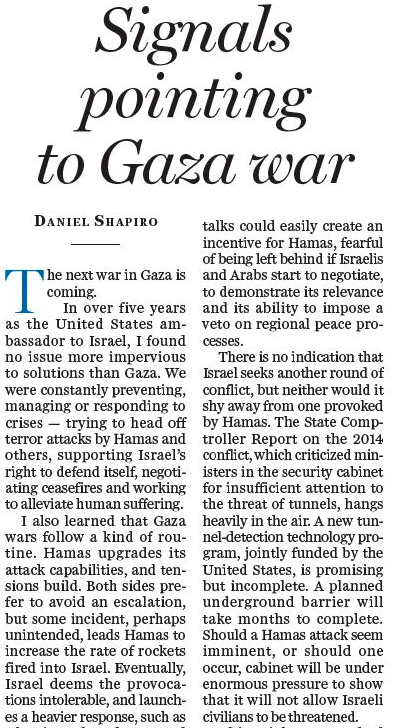 In an op-ed entitled “Signals pointing to Gaza War” which was published in the National Post on April 3, Mr. Shapiro makes this erroneous claim. Contrary to Shapiro’s contentions, Hamas’ very raison d’être is to destroy Israel and to wipe the Jews off the map. If Hamas were avoiding an escalation with Israel, why would they divert humanitarian aid towards terror purposes and not build institutions necessary for statehood? Specifically, the hundreds of millions spent on building terror-attack tunnels, deadly short and long-range rockets, small arms and explosives, and by inciting young Palestinians to be suicide bombers, car-ramming attackers, and knife-wielding assailants. Those attackers (and their families) are all handsomely rewarded and receive stipends by both Hamas and the Palestinian Authority. Hamas still calls for “liberating Palestine” from “the river to the sea,” a clear reference to eliminating all of Israel and they are as bellicose as ever and pose a clear and present danger to Israelis and Jews worldwide. 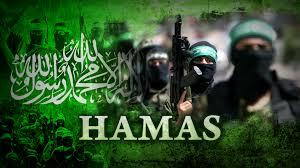 There is no cycle of violence between Hamas and Israel as implied by Daniel Shapiro. The reason a next war may be in the offing is because the Hamas terrorist organization wants to annihilate Israel and purge the Middle East of the Jewish state. Full stop. Its statements and avowed efforts make this abundantly clear. 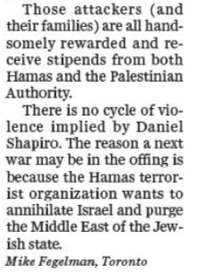 Please send your considered comments to the National Post’s letters editor to point out that Hamas wants an escalation of hostilities with Israel and that this terrorist organization is still bent on wiping Israel and world Jewry from the map. Send letters to: letters@nationalpost.com.